COOP CRATE - COOL NEW PACKAGING!!! Lucinda & I have been researching the best way to package the COOP CRATE since we made our deal with Barbara and decided to really push this aspect of our business. Obviously an actual crate would be too bulky to store and too costly to purchase (even in bulk). So we checked box options (all of them!). Turns out they are quite expensive and we also felt they would be difficult to store in bulk. 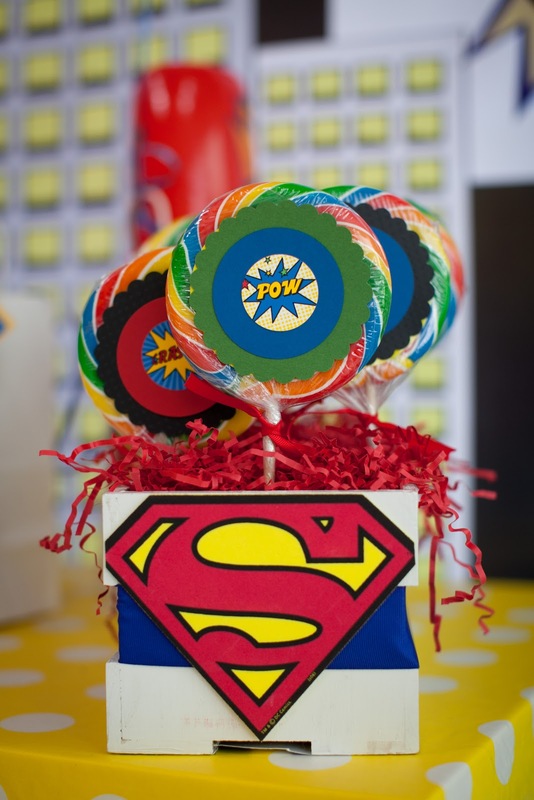 We were racking our brains trying to figure out a cool package when – LIGHTENING BOLT! I had a flash of the ubiquitous IKEA bag. 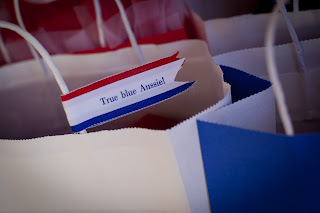 I am not sure if it is quite the same where you are... but here in LA... the big blue IKEA bag is EVERYWHERE! You buy them to put your goodies in at the Ikea register.... and then you use it over and over and over in your everyday life! Seriously -- that Ikea bag is used as a beach bag, a grocery bag, a sports bag, a "park" bag... you name it and people (moms especially) in LA are reusing that Ikea bag in every situation imaginable. 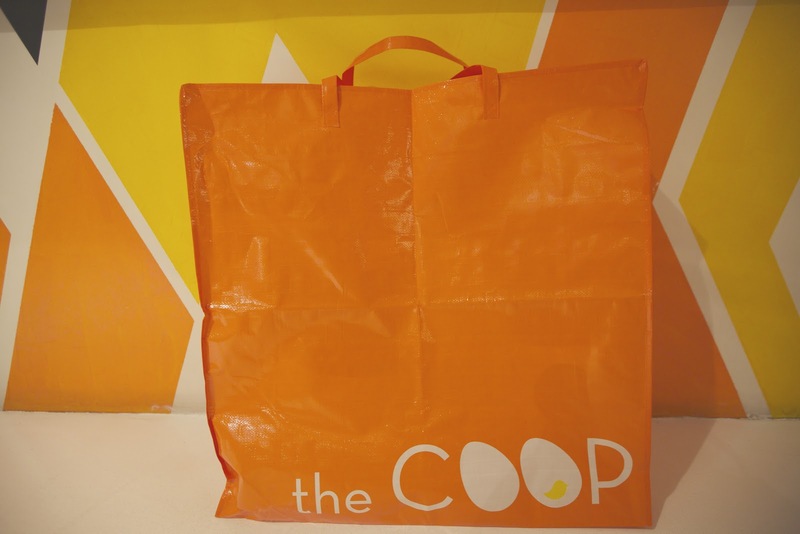 So we thought... let's do a cooler COOP version of the Ikea bag! Our own spin in a fabulous COOP glossy Orange color -- with a yellow zippered top! Which is even better than the Ikea bag... no spills! 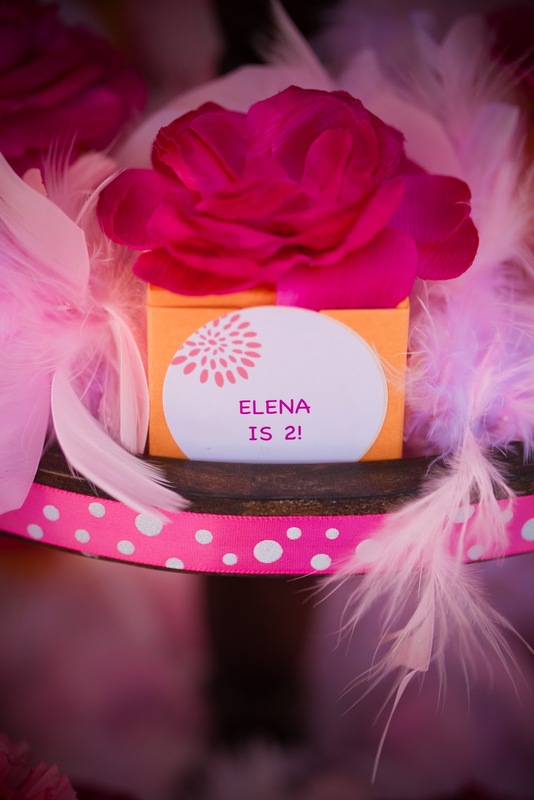 And for the COOP CRATE -- it is great because it's a bit more forgiving than a box. We can stuff more stuff in it! What do you think? Really big, really fabulous. And super re-useable. 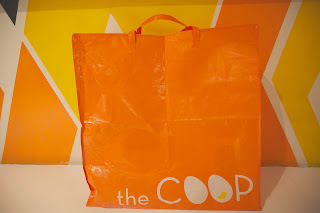 After having your fabulous COOP CRATE party at home – you can use your COOP CRATE bag at the grocery store, beach and soccer game… Just another way the COOP chicks are looking out for their cool COOP mammas!!! Book your COOP CRATE party today and get the fabulousness of a COOP party, delieverd to your front door!!! BRONX TURNS A SUPERHERO 4!! How gorgeous is the Superhero party I just did for the SUPER CUTE Bronx Wentz! 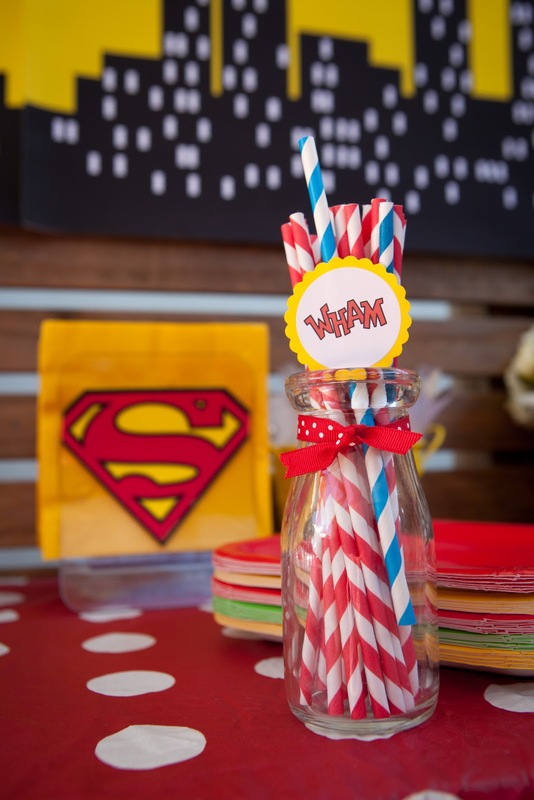 Who doesn't love the theme SUPERHERO? I had such a great time thinking of the colors and little extras I wanted to do. The COOP lobby is such a wonderful happy space and when you add any yellow the front room just glows. 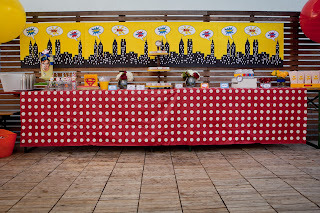 I used our custom made backdrops to cover the windows which with this party also acted as a PAPARAZZI blocker and I also had some cool - graphic backdrops made for the outside patio. 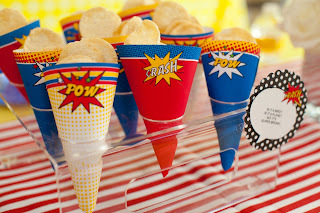 I pretty much hand made everything on this one from the fun party favor tags to the drink cups to the chip cones. No real SUPERHERO party would be complete without some KRYPTONITE Soda so of course we had that and I used my trusty green Aussie licorice as the base. I also found the MOST AMAZING Spiderman balloon it really was life like check it out above. 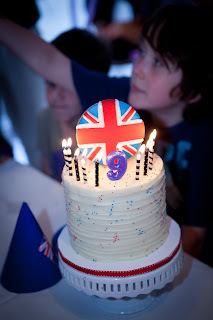 The FAB cake was from an old favorite Hansen's and had all the mouths watering. 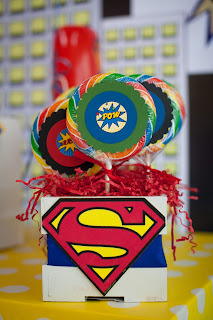 All our little Superhero's went home with a COOP cape, laser fingers, Batman ring, lollipop and WHAM Bat. Pete and Ashlee who are the loveliest people and parents where so thrilled with the party and told friends as they left "same place next year"! 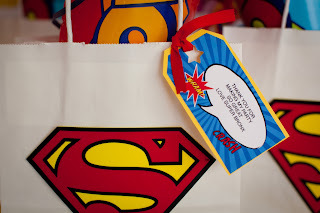 YOU can now get the same party from our COOP CRATE - book it now and party like a COOPER HERO!! Hi everyone!!! We are so so so excited to announce the COOP CRATE! 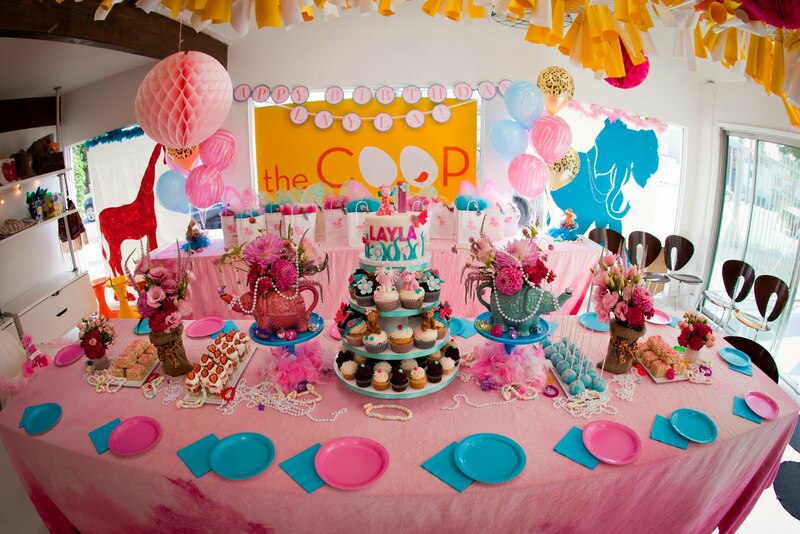 Lucinda and I have been trying very hard to figure out ways to get our COOP concept out to the masses... our COOP 2 GO parties was the first step in that direction. 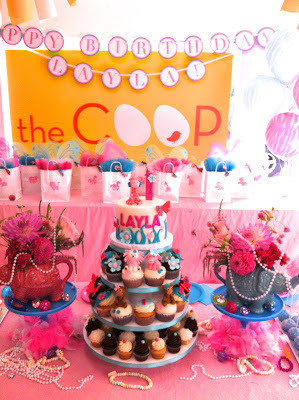 With the new COOP 2 GO PARTY option, you can have the fabulous COOP Chicks design a soiree for your at home celebration! 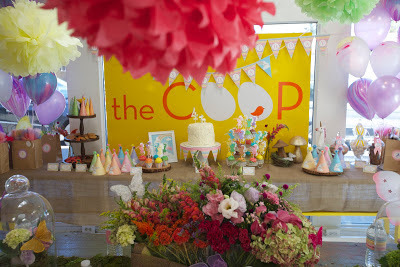 the COOP 2 GO PARTY (details and pricing is avail on our website!) is a great way to get the cool of the COOP -- in your own home. 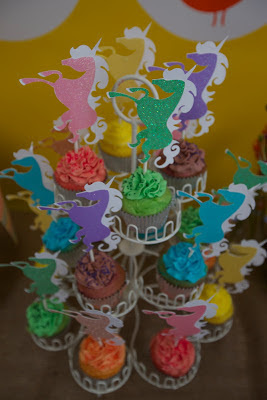 We have done a few of them so far and they have been amazingly gorgeous and super successful. 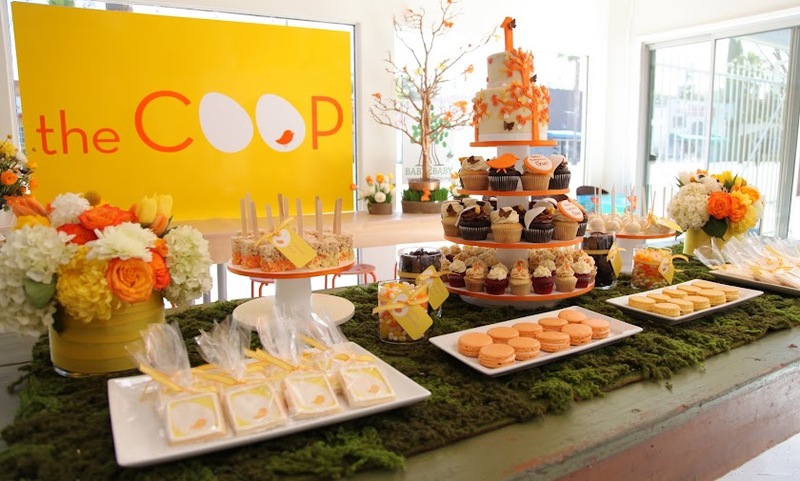 The COOP 2 GO PARTY is wonderful... but we also wanted to reach out further. Further than LA, even. 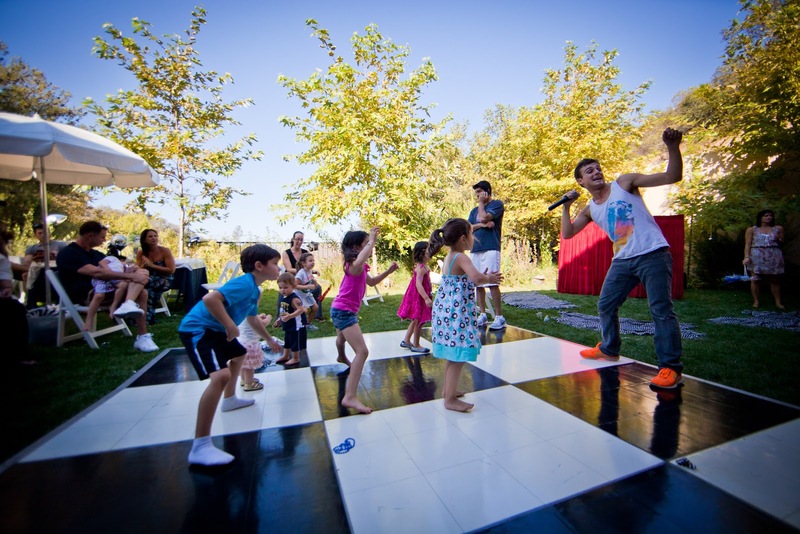 We have always always said that we wanted to make our parties available to people in LA doing parties at home, but also -- people all across the nation! and the COOP CRATE is the first step in fulfilling that dream! 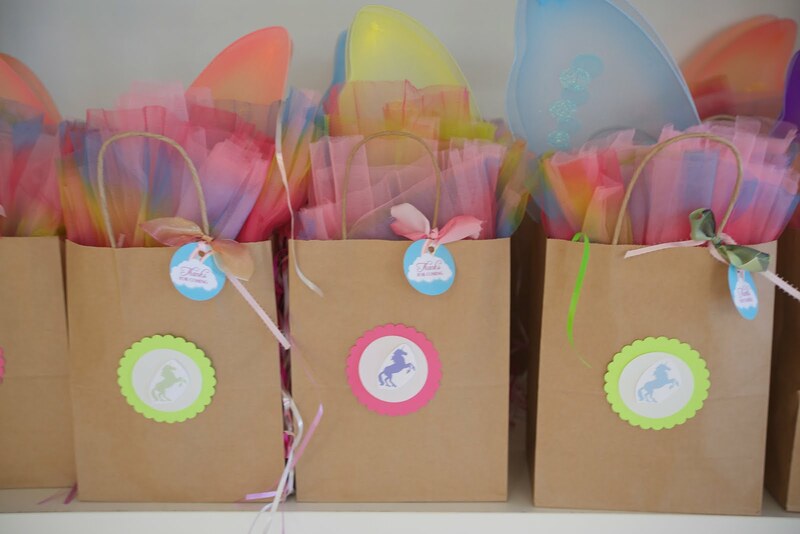 You can now -- no matter where you live -- order COOP Party elements (goodie bags, decor etc) right to your door! Details and Pricing is available on our website. I did my first COOP CRATE this weekend, before we even officially launched the concept. Check out the pic above! 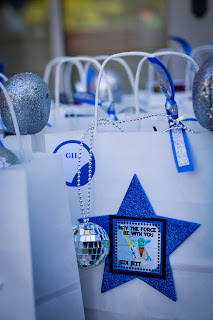 I had to scramble a bit in packing it up -- but I think it looked pretty cool... and the mom was so excited to just swing by and have her goodie bags all done for her at home party! 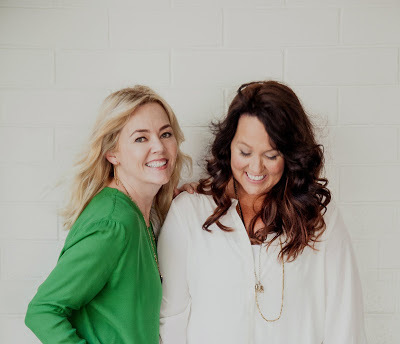 We are so so excited at this new chapter in the story of the COOP.... Stay tuned to see the super cool packaging we designed for this new element of our COOP.... I think they arrive tomorrow!!! My poor little Grant. 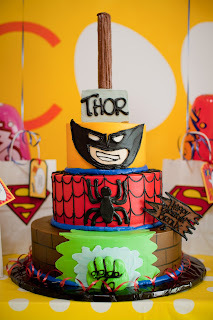 I never let that child choose his own party theme! 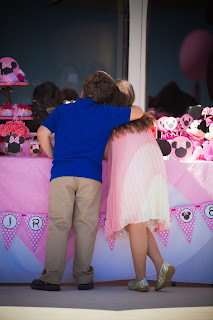 Well -- actually now that I just had a baby girl -- I may relinquish his parties to him... and next year he can have GI Joe or Minecraft or some other theme that doesn't inspire me! 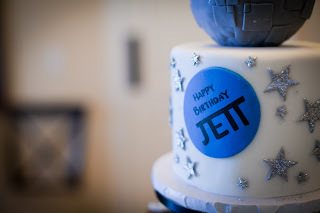 But for this last birthday of his... 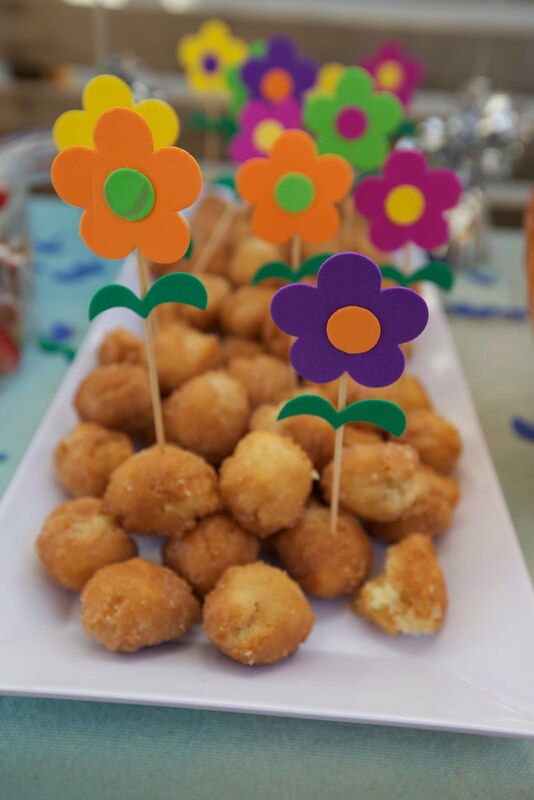 I was only pregnant with my little girl -- and hadn't gotten my fill of flowers and frillie things just yet... so he had to deal with yet another beautiful boy party! I forgot just how beautiful this party was -- until recently. 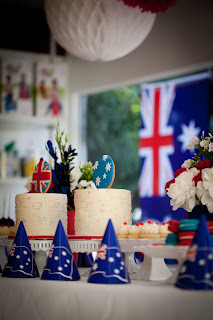 We had someone come in and help us with some PR and she zeroed right in on an image from this party. 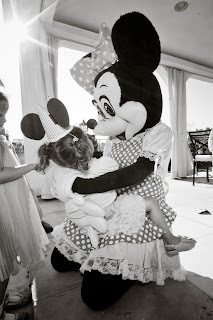 She loved it -- and it reminded me that I never ever blogged about this one! For shame!! 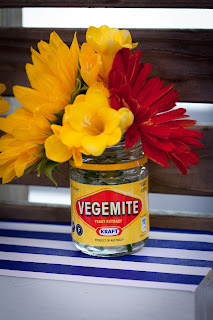 I had made these gorgeous oversized paper flowers for my kids school fundraiser and really wanted to use them again (they are currently in my daughters bedroom... 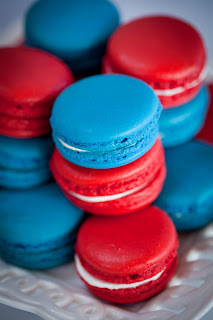 I STILL adore them!). 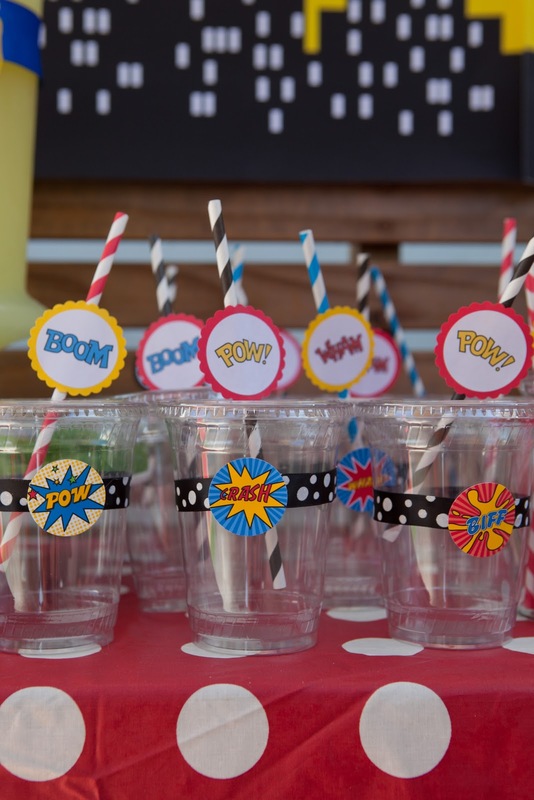 I didn't know quite how I could use them as the centerpiece for a boy party -- till it hit me. 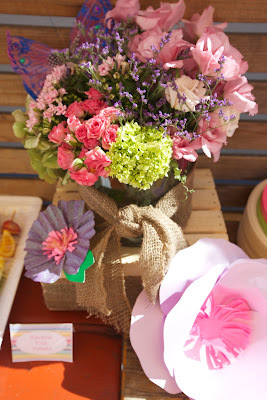 He's an April baby -- April Showers,...bring May flowers!! 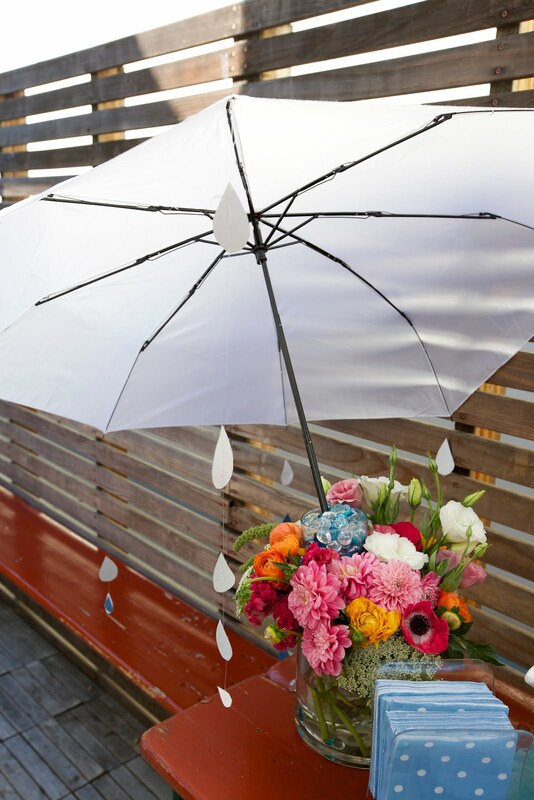 So I ran with a flowers and raindrops theme. 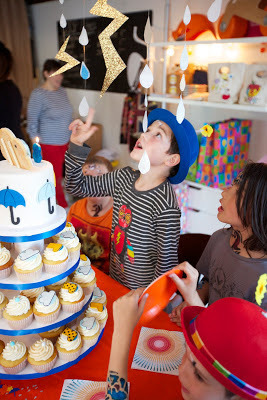 I hand made felt clouds that "rained" blue and silver paper raindrops, and put those gorgeous paper flowers in a large ceramic umbrella holder in the shape of rain boots ( I thought that was pretty clever!) But the piece de resistance... was the entryway. I had a trail of white umbrella from the front gate leading to the front door. They were dripping with paper rain and floating in the air... leading you into the flowers inside!!! I love love loved how it looked. 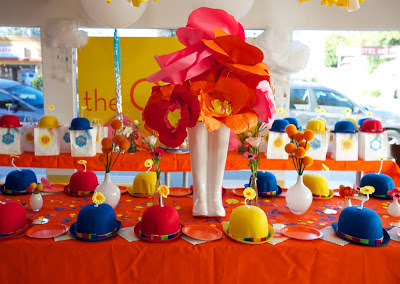 The bowler hats with the flowers growing out the top were also a big reason I went with this theme. I have been wanting to incorporate them into a party for years -- I just think they are so adorable. 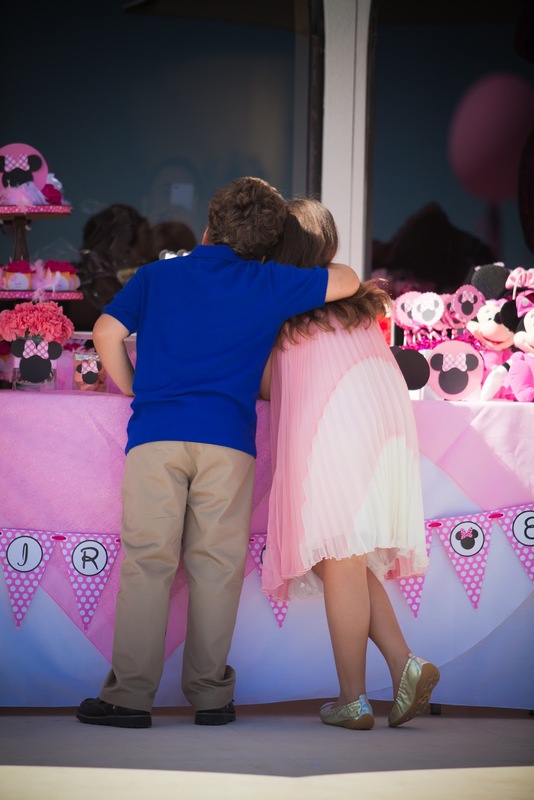 So there you have it -- Grant's final girlie party! 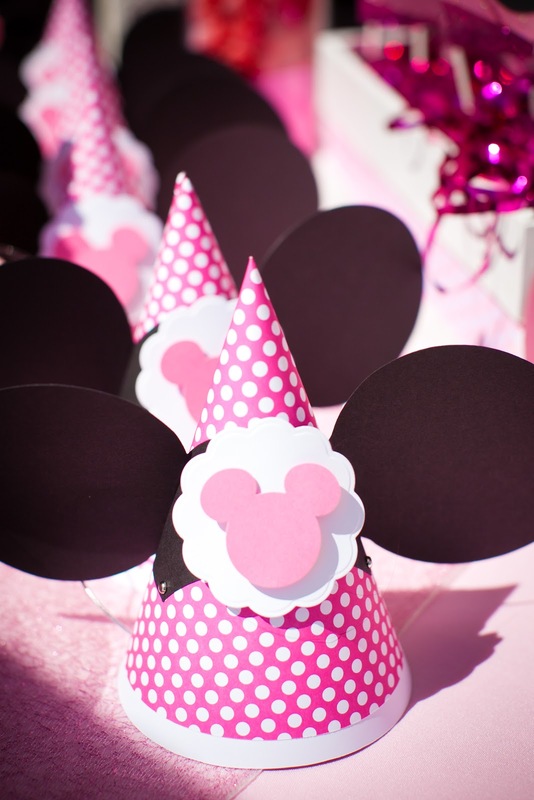 I can only imagine what I will do for my daughter when her first bday comes along.... Stay tuned!!! I love when people come to us with an idea -- but don't really have an idea how to make that idea a PARTY! Thats where we come in! Michael and Bridget came to me and wanted to throw a super fabulous bah for their gorgeous little girl. They wanted it to be girlie -- but their daughter loved animals. They had seen the party I did for Ashlee Simpson last year -- and loved the giant animal paintings -- but were worried if they went with a Jungle party... it would be too "boyish". 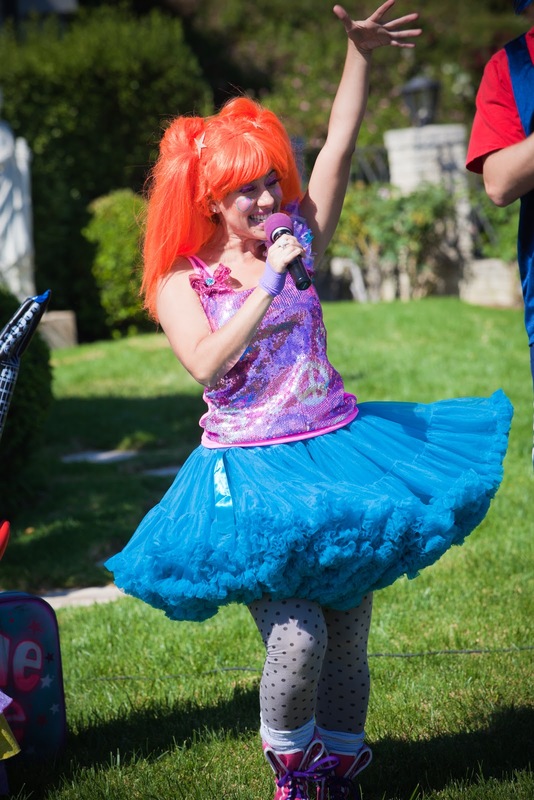 Mom kept saying her daughter loved animals and the zoo -- but she was also super girlie. She loved to dress up and wear her jewelry... and then it hit me.... JEWELRY JUNGLE!!!!! A super girlie Jungle party with loads of girlie elements -- as if we caught all the animals playing dress up in the jungle!!! Mom and dad loved the concept and let me run with it. We chose pink and turquoise as the base colors -- which was great because I happen to own two elephant teapots in those colors that I used as vessels for the beautiful flowers ( I might have actually have driven the color palate in that direction BECAUSE of those wonderful little teapots!). 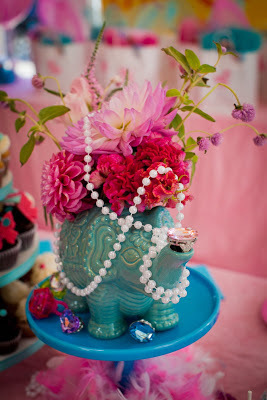 I also happen to be slightly elephant obsessed -- and jewelry obsessed too! 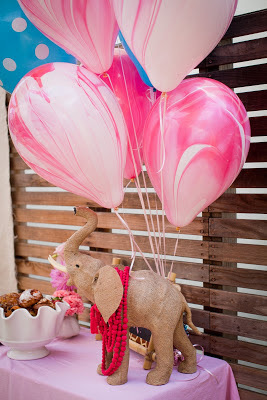 -- so I was able to bring some of my own necklace wearing burlap elephants marching down to decorate the outdoor table. 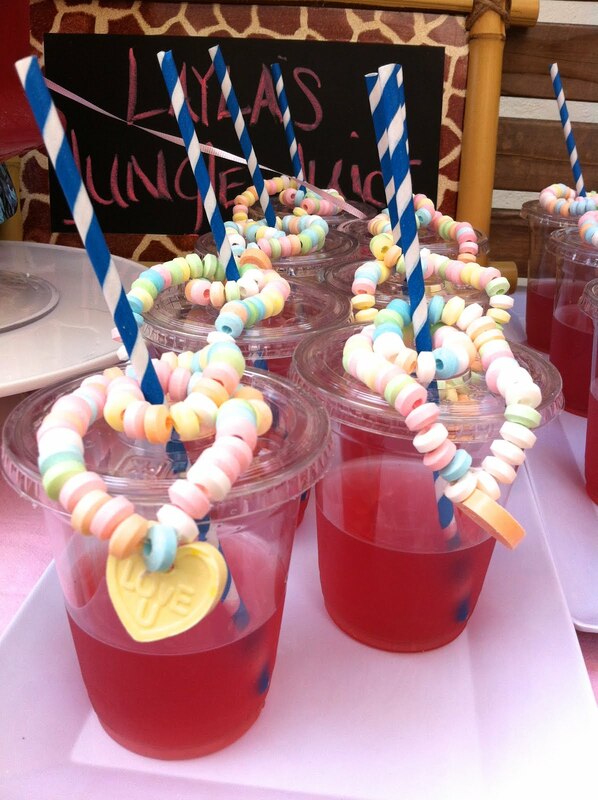 I draped all kinds of necklaces over the pink lemonade container -- and the actual straws on the cups were festooned with candy necklaces. So cute! I am so in love how it all turned out. I love love love to create parties that are more unusual in theme. I mean I love a princess party or a superhero party.... but I really love love a Jewelry Jungle or a Dolphin, Donut, Disco party!! A theme that you've never seen or heard before!!! So so fun. Mom and Dad loved it sooooo that they booked one of our very first COOP 2 GO parties for their son Jett!!! Oh my -- this was a fabulous fabulous soiree! 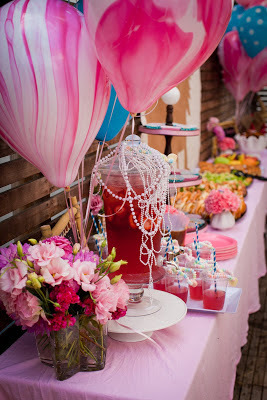 The loveliest couple came to us with their concept for their sweet daughters birthday... they wanted to do a magical enchanted forest theme. 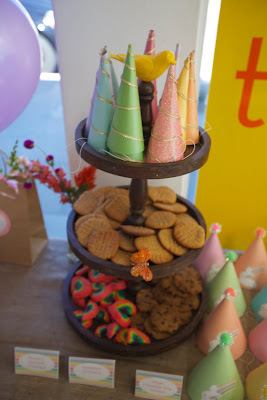 I was so excited at the idea -- they wanted to keep everything woodsy and have me do fabulous flowers in a variety of light rainbow colors to match all the fabulous printables they bought for the party. I used our mossy grass runners and all our wood elements... platters, 3 tier tray, nests, wooden and golden mushrooms and butterflies galore. In addition to the mass of fresh flowers, I also used some of the large and small paper flowers I made in lavender and pink hues. So pretty. 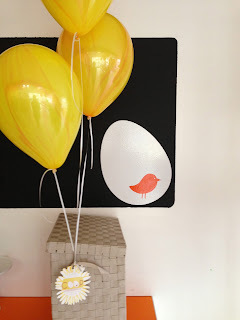 I also made a beautiful light creme burlap and gold glitter Happy Birthday Banner that we hung outside over the food table. And how about those balloons? 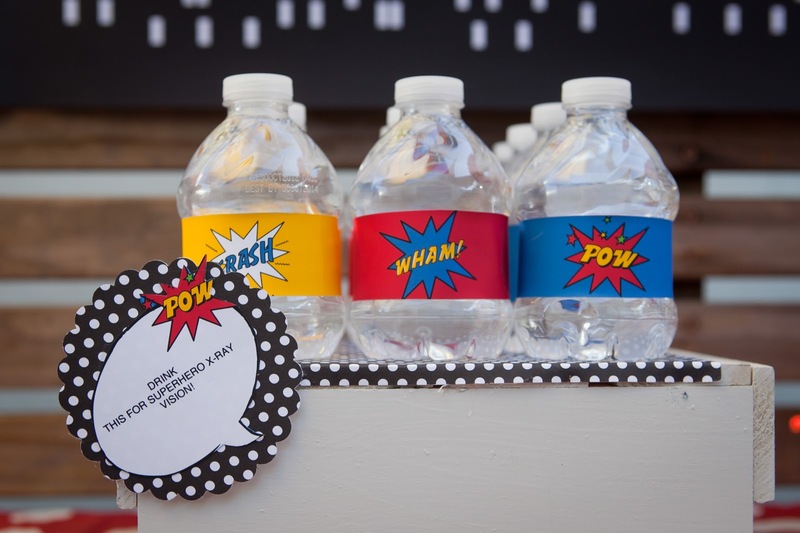 They matched his printables PERFECTLY!! I couldn't believe how perfectly the colors matched! 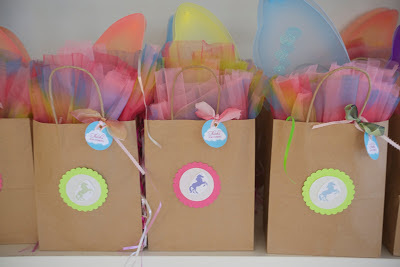 The goodie bags were packed with Rainbow tutus (another perfect match! ), wands and butterfly wings for the girls and Merlin hats and wands and black capes for the magical boys! One of the dads handmade all the cookies and cakes which were absolutely divine... and looked spectacular in the magical world we had created. 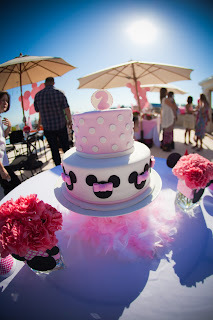 It was really a beautiful beautiful day for a lucky little girl whose dads sure know how to spoil a lady!! COOP PARTIES 2 GO TAKE FLIGHT (part 2)! Our second COOP Party 2 GO was for a very special young man named Jett. 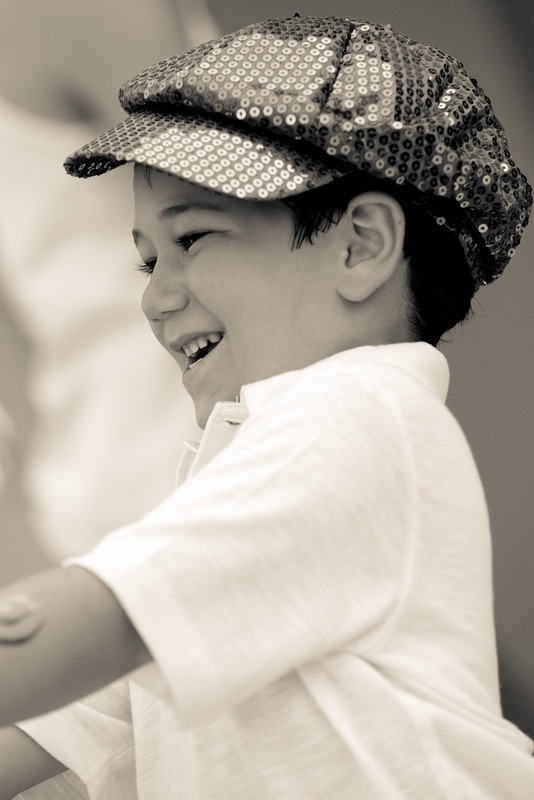 I just loved this little guy he has SO much personality and charm so it was no surprise when he chose a Star-wars/Dance/Disco Party as his theme. 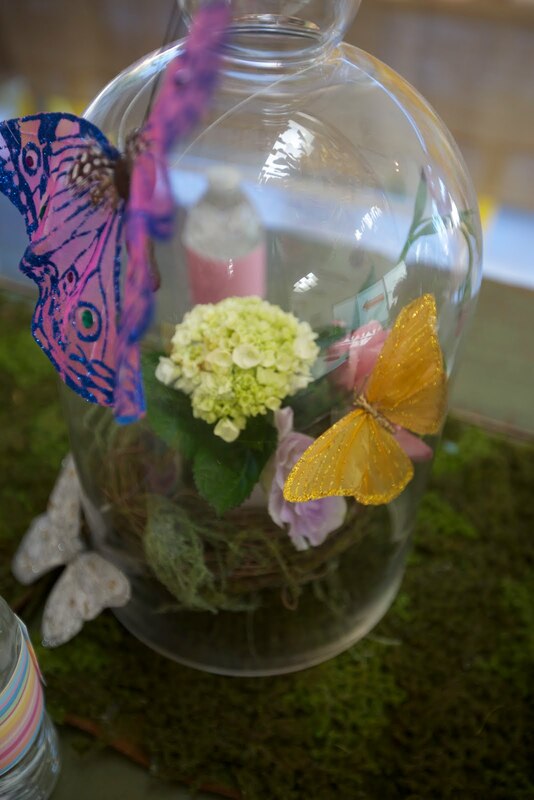 Mom and dad really helped out on this one and we worked very closely to bring together all the incredible elements. 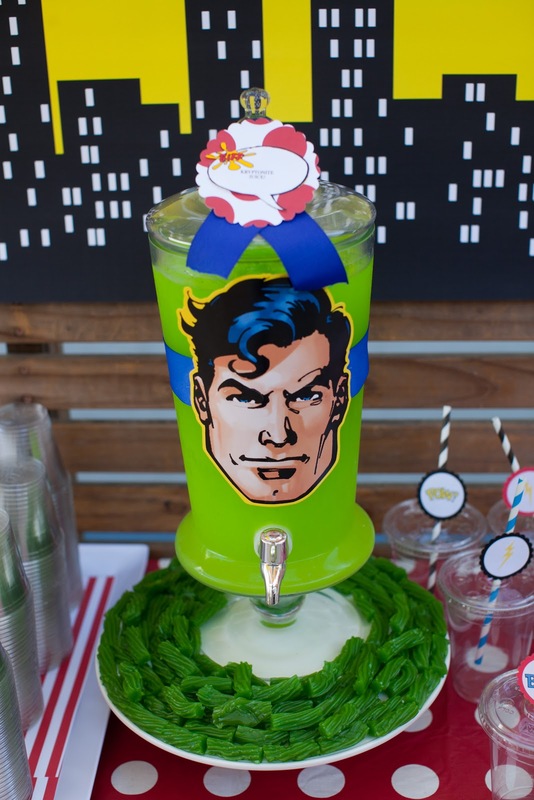 We had Yoda Soda, Disco dance dress up, mirrored vases with gorgeous peonies a cool graphic dance floor with an even cooler D.J, a bouncer and a airbrush tattoo artist. It was a very hot LA day but none of our little Jedi - groovers seemed to notice as they danced the afternoon away. We LOVE our parties at the COOP but how great is it that we can now bring our secret magic into any home! COOP PARTIES 2 GO TAKE FLIGHT!! Life has a wonderful way of giving you what you are looking for at exactly the right time. 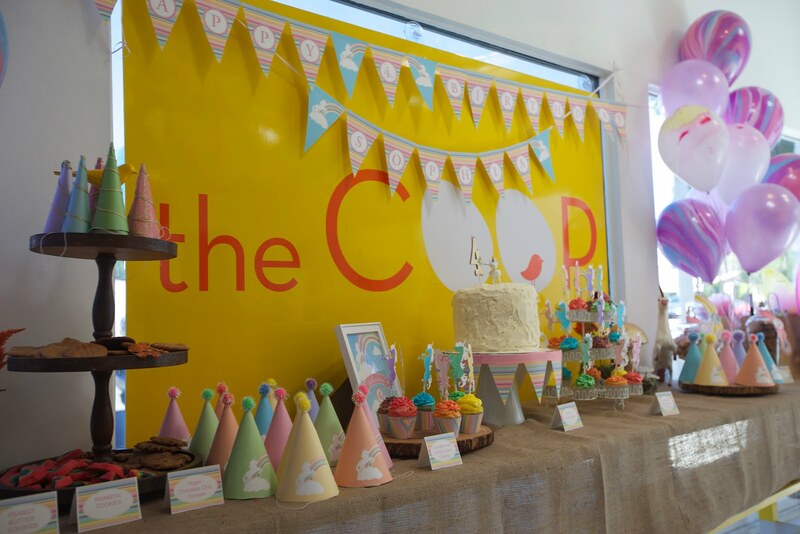 Juliet and I have been working our hearts out at the COOP over the past four years pouring everything we have into each and every party and because of that we have been blessed to book up our parties months in advance. 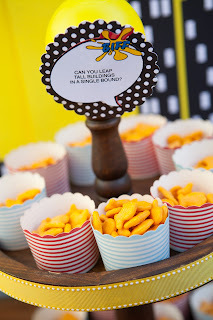 It was from one of these parties that a friend of a COOP client had seen pictures of, an Elmo party (goldfish party favors and all) that we got our first opportunity to create a COOP Party at some ones home. The friend had just LOVED what we had done for our clients Elmo Party but the dilemma was we had no times available for the weekend she wanted so she innocently asked "Would it be possible for you to bring all of your wonderful creativity and passion for parties into my home?" WOW - the question that changed it all - ABSOLUTELY we said and we set to work. Juliet and I really believe in all the little details and every portion of this party was perfect. From the pink Minnie balloons surrounding the fence to the incredible favor table with all kinds of delicious treats. Most of everything we do is custom and that is what gives our parties such a lovely special feel. 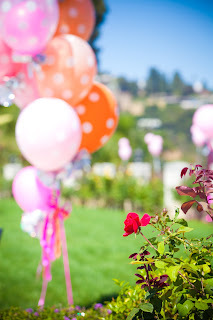 The setting of this party was incredible and so we made it fun with lots of pink and balloons and flowers. 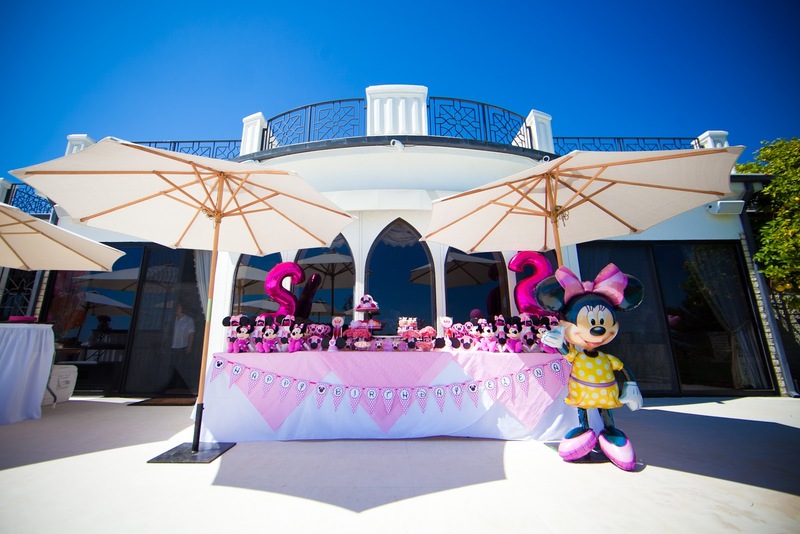 We bought in the wonderful TWINKLE TIME and of course Minnie Mouse. Juliet and I where so thrilled with how it turned out (we even had some of the super chic guests expressing they had never seen a kids party like it!) 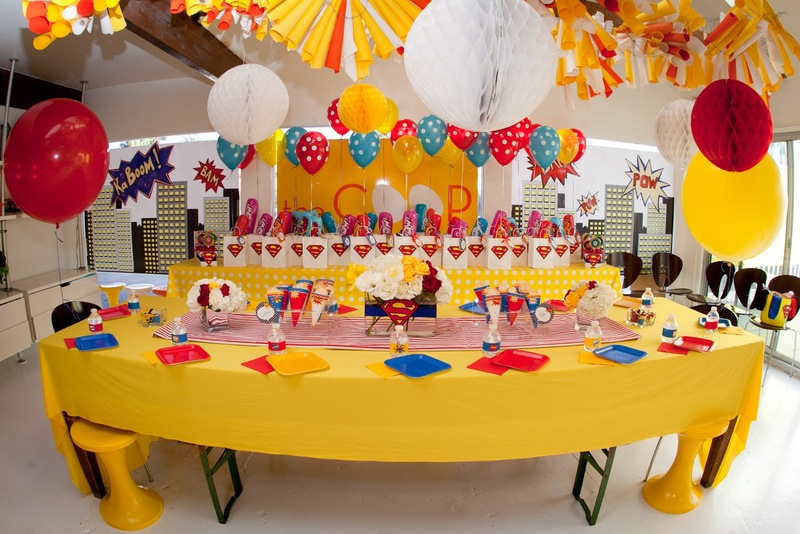 That we thought "wouldn't it be great if everyone could have a COOP party at home no matter where they lived? 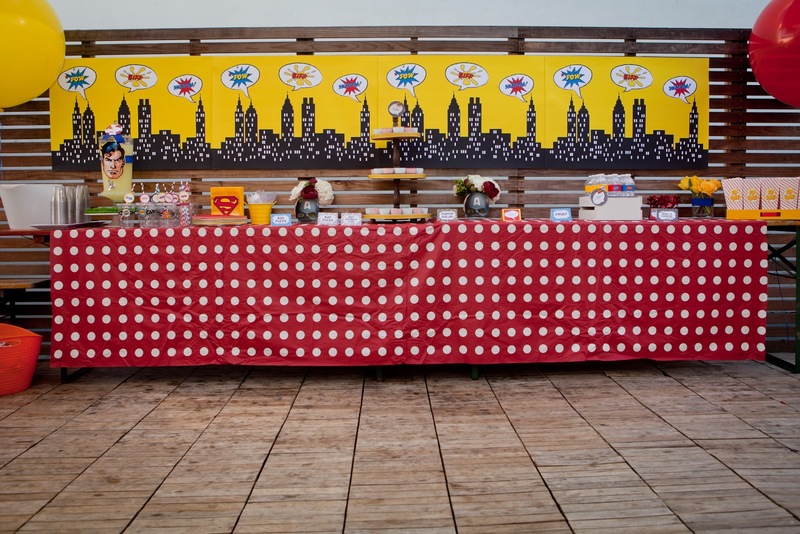 So we created the COOP CRATE idea where we ship all the things you need to have a SUPER COOP PARTY right to your door - or you can pick it up in Los Angeles. 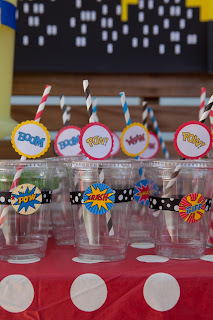 Check out all the PARTY 2 GO and COOP CRATE details on our site and get your COOP PARTY ON!! 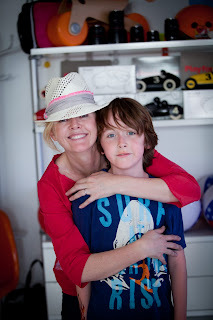 It is always a challenge for me when my two sons Dash (9) and Abe (6) have a birthday as their birthdays fall within 5 days of each other, meaning that I need to come up with a theme that they both agree on. This year to avoid the Star-wars versus Harry Potter dilemma I decided to do an Australian theme which is close to my heart as I grew up in Perth West Australia. 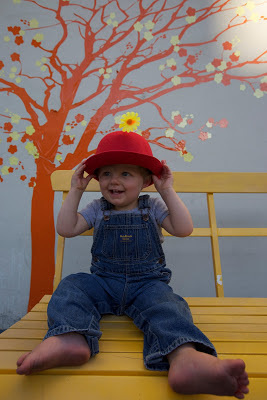 Once both boys agreed that this was a pretty cool idea I went full steam ahead. As I wasn't particularly fond of the Australian colors of green and gold I decided to go with the colors of the Aussie flag RED, WHITE and BLUE and once I made that choice everything fell into place. I went nuts on this party I envisioned a really cool table with lots of treats and had the uber talented Julie of Blue Cupcakes come in to assist me in creating the magic. 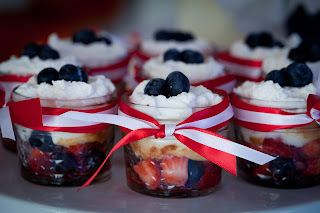 I told Julie I wanted red, white and blue parfaits in little jars and blue and red macaroons. 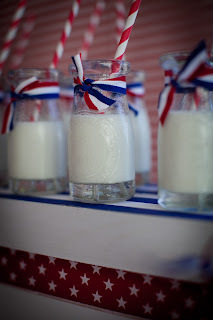 I let her use her own creative genius on the cakes and I went to work on the little milk jars, spray painting the white bases finding the perfect ribbon and perfect straws. I used Australian Vegemite jars as vases, ordered Aussie flags to hang and Aussie party hats. 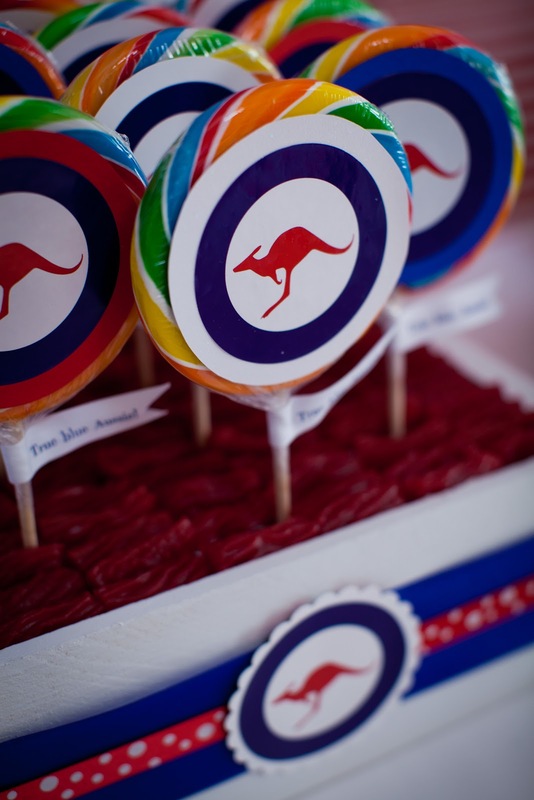 I knew my lollipop crate needed some red so I popped in some Aussie licorice to give it that pop and it worked brilliantly. 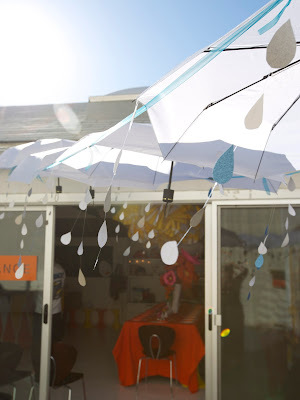 I spent night after night cutting, pasting and gluing and I loved every minute of it. 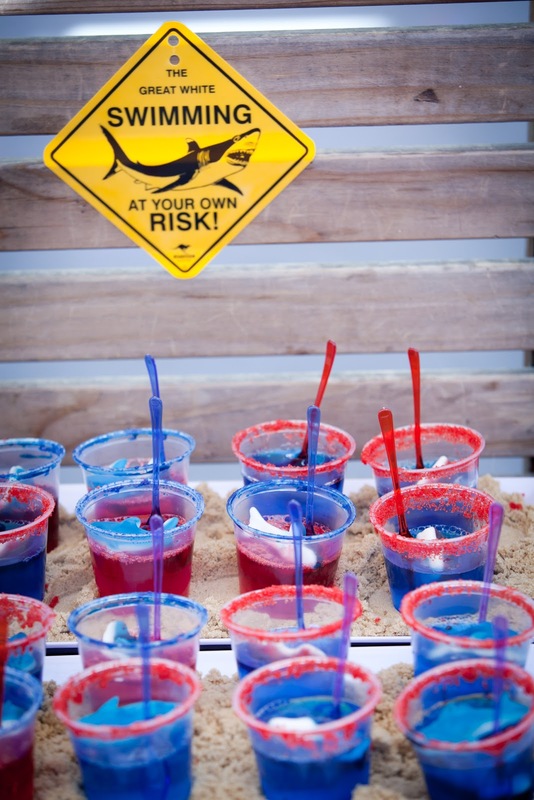 Juliet told me that I had to make shark jello's and at the very last minute I went for it and they were one of my favorite bits. 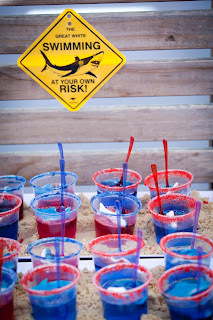 We had tacos and fosters and a kangaroo margarita station and it was quite possibly the best AUSSIE bash ever.. One of my absolute favorite blogs the Hostess with the Mostess featured the party so if you want more Aussie pics check it out!